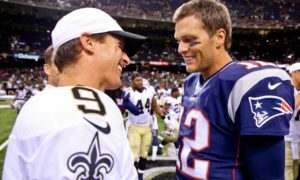 Super Bowl 53 (sorry in protest of the NFL, I’m not gonna use Roman Numerals) “should” have been a lot of things…..
Brady vs Brees—Brees winning would still leave Tommy the best ever but with all of his records, Brees would have more than entered the conversation with a victory. Belichick vs Payton—win or lose Belichick is the best ever—I’m not a “never” guy but how can anyone ever do what Mr Bill has done in New England? The answer is never especially in this day and age of powerful parity. The only Head Coach and QB combo who have won more games than Sean Payton and Brees in NFL history….yeah the hoodie and Tom Terrific. Deflategate vs Bountygate—yes both of these franchises have their NFL warts but continue to survive and thrive. Woulda….Coulda…Shoulda….thanks to the worst “non call” in the history of sports. I’ve let this call marinate for over a week, listened to all the debates and I still haven’t flinched. The Saints got a raw deal. You can say a lot of things about the hand the Who Dats were dealt—funny the commish didn’t say anything for a week and a half? Silence speaks volumes and when he finally spoke he didn’t say anything groundbreaking enough to explain the 10 day silence? How Roger Goodell is still employed shows how powerful the NFL is— he’s tripped over himself countless times since taking over 13 seasons ago–ironically the same season the Payton/Brees era kicked off in 2006. 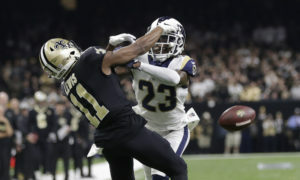 Yes the Saints could have stopped the Rams after the No-Call. Brees didn’t have to throw an interception in overtime and the Rams performed like champions with two HUGE kicks to advance. It’s not their fault, it’s the officials. My point–none of the above would have mattered if you make the call which was as obvious as you’ll ever see. Spare me the notion that there are lots of bad calls in games. While I agree with that, I also contend no call in the history of sports had an impact like this no call did where its timing was impeccable. You’re telling me with 1:49 left on the clock the immortal and now never silent Nickell Robey Coleman gave the officials a softball and they whiffed mightily. Remarkably they choose C ?! 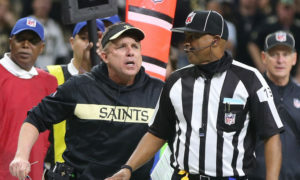 Yes I’ve never liked those who blamed the officials–it’s whiny and weak but there is an exception to every rule and we found it this year in New Orleans. What should we do to fix it moving forward? I don’t think you need to now review every pass interference call but how about we give coaches one “Wildcard” review flag in the final quarter that they can use to review ANY call they wish? Maybe that would help avoid anything like this in the future. It could include Overtime where while we’re at it–we need to fix that too. Also in the system of checks and balances–how can Major League Baseball review every play from their Mothership in New York when they play countless games every night in the summer yet the NFL can’t do the same? We need the league to step in and police something like this in the future when so much is on the line? The Payton-Brees era has been great in New Orleans but even if they win another ring, maybe in Miami next year—their legacy will forever be filled with what if’s? What if they would have avoided the Minnesota Miracle and now what if they would have sidestepped the worst call in sports history and were able to run out the clock and kick a game winning field goal? It’s not just Saints fans complaining—Bengals fans, Packers fans heck Islander and Pacers fans you saw it and shook your head too. Many with no “dog in the fight” are howling and that’s a rarity. Moving past the NFL’s nonsense we appreciate you taking our first trip in the Naborhood in 2019—as always thanks for stopping by. FOOTBALL DREAMLAND: It’s funny I write these blogs every month and sometimes have no idea what I’m gonna write about till the last minute. Before the NFL playoffs, my mind was on my first job in Tuscaloosa back in the early to mid nineties and how it’s truly amazing how a city of just over 100,000 is such a fertile ground for NFL Dreams–especially recently. 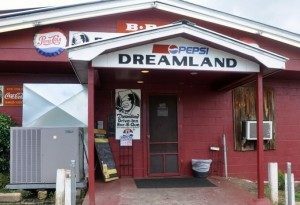 Yes Dreamland barbeque is a landmark in T-Town (even though I think there are more worthy contenders—Archibald’s and Full Moon, but I digress) Yes this city is a Dreamland in other ways—let us count the ways already in 2019. Dabo Swinney was once a walk on wide receiver and had to be begged by his coach Gene Stallings to get into coaching first as a graduate assistant and then a wide receivers coach for Bama–now Dabo is on top of the college football universe with his second Natty and his second win over the mighty St Nick. It will be interesting to see if he ever replaces the master one day and returns to his alma mater. Gotta be tempting but he built Clemson–he would only be reloading Bama? Swinney was in Tuscaloosa in 1997 along with a few other notable football newsmakers so far this year. 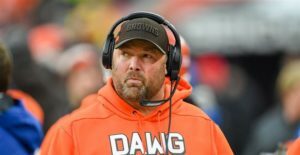 Freddie Kitchens is now the Head Coach of the Cleveland Browns. This is simply amazing. I remember covering an 18 year old Kitchens when he was the number one rated quarterback out of Etowah High School in Attalla, AL outside of Gadsden. Kitchens was solid at Bama but never had a pro career. Out of school he worked at a local car dealership in Tuscaloosa and on the weekends washed Fed Ex Trucks where he would hear Alabama games on the radio—hearing those while working in a job he didn’t like motivated him to get back into football. A few decades later, he’s an NFL coach. 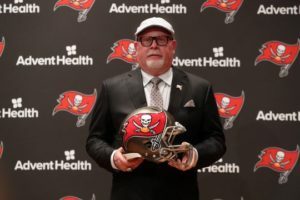 Bruce Arians is a great hire by the Bucs. He brings experience, needed swagger and the best QB whisperer Jameis Winston could ask for. Ironically back in 1997, Arians was Kitchens’ Offensive Coordinator for then Alabama Head Coach Mike Dubose. In what was a losing season, Arians and Kitchens had a chance to salvage it with Bama’s first ever win against Auburn in Jordan-Hare Stadium. In the closing minutes on their 36 yard line and facing a 3 & 8, Arians could have played it safe and called a run play and then punted the ball deep in Auburn territory but instead had Kitchens pass the ball to fullback Ed Scissim who fumbled. Auburn would recover and go on to kick a game winning field goal— Arians was fired four days later–this after just building a new house. The firing ended up being a blessing for Arians who was then hired by the Colts to mentor some young upstart named Peyton Manning? Dream Big Folks—and don’t let the hiccups keep you from reaching the stars—amazing three big ones in the football world were huddled up together in Dreamland back in 1997 and are front page headliners in different arenas these days. BILL MURRAY DOC: From Dreamers to Documentaries where Netflix just cranked out another beauty I would recommend especially if you love Bill Murray and frankly–who doesn’t? 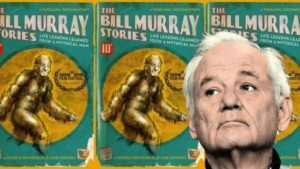 The Bill Murray Stories, life lessons from a Mythical Man gives us video proof of what many of us have heard for years about the celebrated actor—he lives life on his own terms. It’s funny he’s never had an agent, just a simple yet guarded 1-800 number and an answering machine for potential suiters. While this doc takes us into that world it mainly highlights spontaneous encounters where Murray touches lives by simply showing up anywhere and often at any time. A few great examples from this doc have Murray distracting a couple in Charleston while they are taking their pre-Wedding pics–so what happens, they have Murray join them for the shoot! You’ll see the pics and hear the background story. There is a bar in Austin Texas, Murray shows up and at the end of the night becomes your celebrity bartender. And maybe my favorite, Murray on location for another movie, stumbles upon a house party and winds up playing the tambourine with the band and then takes pictures with the police who try to end the party. Thank god for camera phones or we would never have proof—but Murray lives life differently where you get the feeling he just wants to be a normal guy. 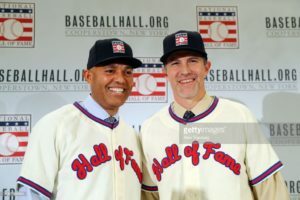 BASEBALL HALL MISSES: I applaud the Baseball Hall of Fame Voters for finally getting it right and voting in a player unanimously—yes Mariano Rivera, the best closer ever deserved it but then again so did Mantle, Mays, Jackie Robinson and most recently Griffey but I guess you gotta start somewhere. 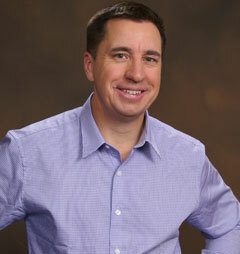 As for this year’s class I think I have flip flopped on the whole steroid vote. 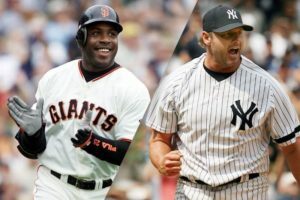 I used to think Barry Bonds and Roger Clemens should get in because they unlike Sosa, Palmeiro and McGwire would have been good enough without PED’s but after more thought–I still don’t know when they started using and it really bothers me they continue to lie about their use–so you know what–let’s keep all he cheaters out–and that includes you too A-Rod in a few years. I still want Pete Rose in though–I know he earned all those hits. As for this year’s class while Rivera was a gimmie—if you’re gonna let Mike Mussina in (questionable) and Roy Halladay (deservingly) you must have Curt Schilling in as well. He had more strikeouts than both and was a far better and more impactful hurler in the postseason with an 11-2 record. Yes he’s crazy on Twitter and opinionated when someone puts a mic in his face but that shouldn’t matter. If you had me pick between Mussina, Halladay and Schilling for one big game, I wouldn’t hesitate–give me the guy with the bloody sock. 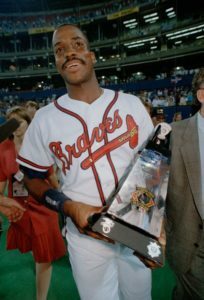 One other note if you are gonna induct Harold Baines which I disagree with—you gotta allow admission to Fred McGriff. who should be in regardless. McGriff played three less seasons and had over 100 more homers than Baines and nearly the same average, amount of RBI and hits. He was more productive in the postseason than Baines too. The Crime Dog’s day should come down the road like Baines via the Veteran’s Committee but he should have already been voted in. NOBODY ASKED ME, BUT….You can criticize President Trump for a lot of things, and trust me I’m not a supporter but do we have to jump all over his food selection for entertaining sports teams? 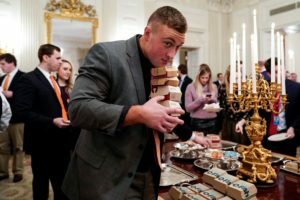 Trump recently entertained Clemson by serving up a who’s who of fast food in McDonald’s, Wendy’s, Burger King and Domino’s pizza and was lambasted by several media outlets. Ok, maybe this isn’t making America great or healthy again but can we loosen up just a bit–we’re talking college kids—I think we all ate this stuff in college—it’s ok.
What the Trump critics don’t seem to realize is that criticizing Trump for everything is gonna bring his base closer and closer together—it’s almost like telling your daughter I don’t like that guy you’re dating over and over again after a while you’re just bringing together what you’re trying to break up. Forget Dallas these days, the Steelers are truly America’s team—they always travel well and a big reason for their success is continuity in ownership and with their head coaches (3 in the last 5 decades) they are always competitive and as a result their fans stay loyal.